The sequel to Carma Naylor’s first book, Volume 2 is more than a captivating story; it contains critical insight into the surprising origins of LDS scriptures and the roadblocks that make it difficult for a Mormon to doubt Mormonism. Carma also sensitively reveals the secret ceremonies of Mormonism out of a genuine desire for Mormons to find freedom in Christ. This insightful book is packed with information that answers the questions a disillusioned Mormon would ask, if seeking the truth. But, as important as that is, Book 2 offers much more. It is a story of faith, hope, love, and healing. It is a powerful presentation of the true gospel of Jesus Christ and the grace that He offers. SPECIAL NOTE: Print Books are currently going through a revision and will soon be available again in their Second Edition. In the meantime, the First Edition is still available online, through the Chapel Store, a ministry of the Calvary Chapel movement. The E-Book format has already been updated and is available through the links below. Carma Naylor’s riveting story started in the first part of this two volume book. 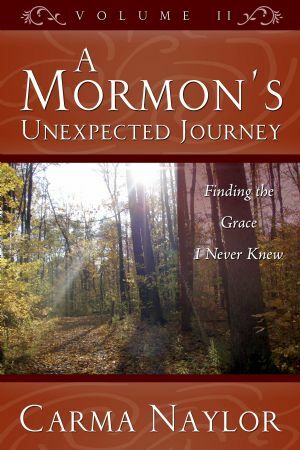 Click here to find out more about A Mormon’s Unexpected Journey: Volume 1. Is there an ebook on line? Yes, the e-book is available from Amazon, Barnes and Noble, Family Christian, Apple iBooks, Kobo, and many other retailers of e-books worldwide. You will also find some sections of the book available to read for free under the “Extras” tab on this website.